While traveling last week I had the pleasure of accidentally seeing Jim Hodges, “Give More Thank You Take” show at the ICA Boston. Admittedly I go to this museum less for the art and more for the quiet, air conditioned front row seat to an otherwise busy harbor, I am at times pleasantly surprised. This is no exception. Along with the Jim Hodges show, there was a deep cuts show of Eleanor Antin’s work “Selves”, a gut/heart wrenching installation “A World of Glass (2011)” by Swedish-born artists Nathalie Djurberg and Hans Bergby (beautiful music! ), and a sweet and thorough “Expanding the Field of Painting” overview from their permanent collection. Overall an A-plus visit. Jim Hodges’ show, was comforting in the sense that his is a body of work as spastic and varied (on a much larger scale) as my own. He very consciously shifts perceptions of himself, and charts his own map by some obvious (i.e. smashing mirrors) and not so obvious ways (“dark gate” installation). His work is always tethered to art history in some way, as well as his personal experience. Photo courtesy John Kennard and the Boston Globe, Jim Hodges “the dark gate” invites viewers to walk into a timber, “Shalimar” scented room framed by steel spikes. His refusal to sit with a particular aesthetic or signature mark is refreshing and exciting. And Hodges is part of the lucky camp of male artists who get to work with flowers and not get harassed for doing so (e.g. Alex Katz, Andy Warhol). Lady artists know if they made a curtain of artificial flowers they would be pummeled by critics as decorative and silly. Or how about a deconstructed Bonwit Teller bag with drawings of flowers on it (Shopping! Flowers!)? Fortunately, this sideways homage to Warhol (he dressed windows at Bonwit Teller before becoming an art star), makes sense coming from an aspiring gay male artist. Jim Hodges, “Deformed”, 1989; altered shopping bag; 30 1/2 × 34 in. Photo by Ronald Amstutz. © Jim Hodges. 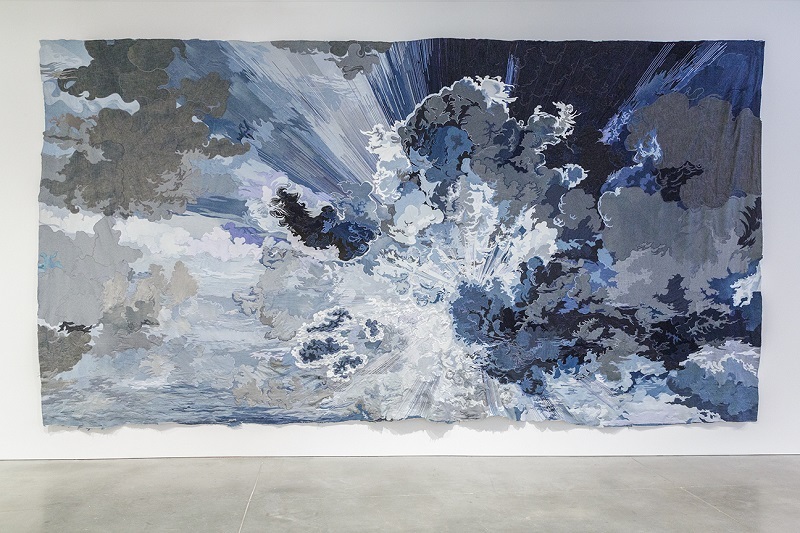 One of my favorite pieces was a giant seascape made out of pieces of denim, titled “one day it will all come true” – it is a work of labor, a subversion of everyday materials, and a collaboration. Again a massive sewing project that seems a safe route for a male artist, though if a female artist did it, it would be called a quilt. Jim Hodges, Untitled (one day it all comes true), 2013. Denim fabric, thread, 144 x 288 in. Private Collection, San Francisco © Jim Hodges. Photo by John Kennard. Hodges’ work is a mix of serious and lighthearted issues – the trace of a life lived fully in his emotions and his intellect. His struggles and triumphs are obvious in his work and he is confident and generous in sharing. Thanks Jim. After a long week away, lots of plane time to navel gaze, and long walks on an island before, during and after a little hurricane, I couldn’t help but consider the notion of cartography. What does it mean to make maps versus follow maps? Like most of my colleagues, I spend a lot of time applying for grants, approaching galleries and hoping for residencies to pan out logistically. I just realized this past week that this is the equivalent of following a map, and a map of the well traversed and scored territory that is the art world. Thrilled with this reminder, I return home with my cartographer’s hat, determined not only to chart a new course, but to continue to defy the maps and conventions of the art world and make my own. We no longer live in a period of art history where authorship makes any sense, so why try to make a signature mark? Why not drop the ball (AKA expectations) and start again. I am not a painter, I am not a drawer, I am not an installation artist, I am not a curator, I am a cartographer and all of those things. Counting, walking, measuring, archiving, noting, collecting and observing. 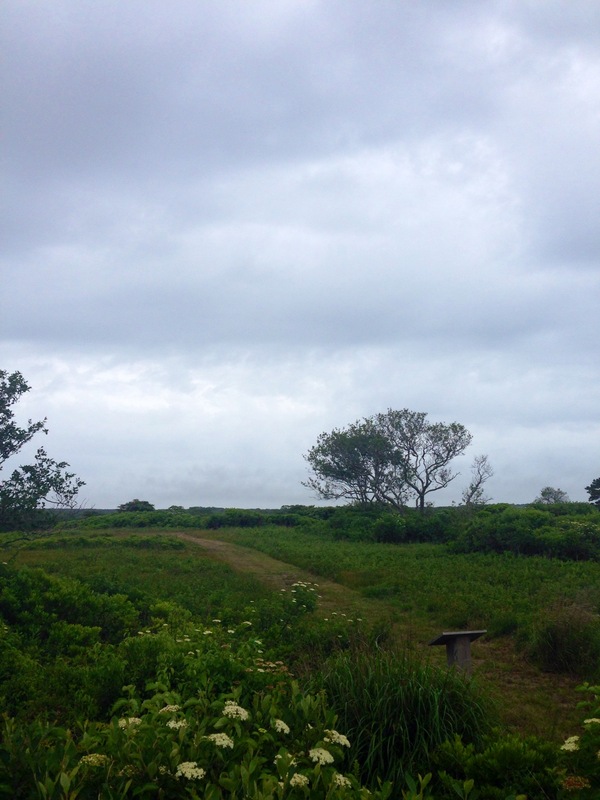 I will use as many tools as I can to navigate the clash between the desire for measurement and the chaos and unfathomable vastness of the world. And I will always remember that the journey is the trace of what is needed, not external to it but part of it. Seeing Hodges’ work at the ICA in Boston confirmed this cartographic position. I am reminded that the mad mix of mediums is wonderful – it simply takes courage and a cartographer’s eye – out with the maps!